I want to come back to Austin Kleon’s excellent book “Steal like an Artist” to give you a warning about something you can’t stop once you started. So, beware! You were warned :). Now, the problem with this is: Once you started to analyze music, design, art, <whatever it is you do>, you won’t be able to go back to this naive, innocent state of mind you had before, where you we’re able to perceive the whole thing at once and like it or not. You listen/look closer to understand, to learn how it was done, you wonder how cool it is, maybe how you could use this for your work. You’ll find a cool base line in a bad song, you’ll find bad beats the favorite song of your youth. The point is: You don’t perceive it any longer as a complete piece of art. You vivisect it, cutting it into small pieces and stripes: a bassline, a drumbeat, a chorus, a refrain, specific usage of material, the use of paint, historical context, fellow artists, whatever. Once I started analyzing I was not able to just “listen to the music”. 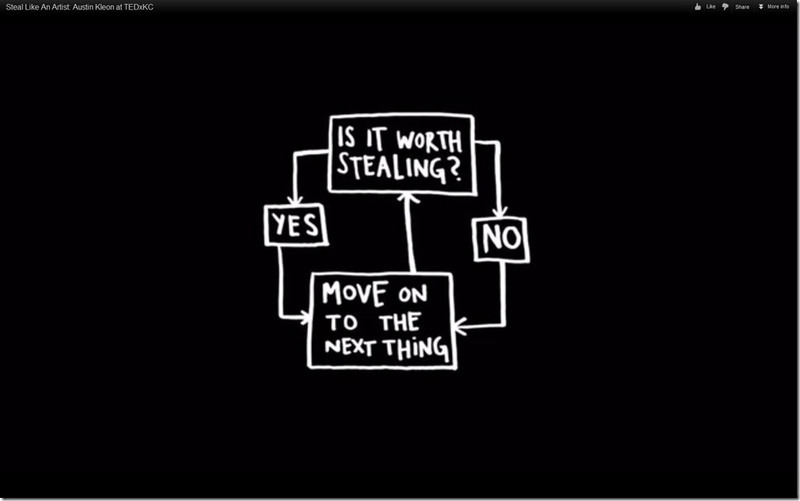 Everytime I’m in this “is it worth stealing” mode, like shown above. So, if you’re still innocent: Beware of the Analyzer. You may never come back. Is it just me or do you have the same “problem”? Still able to perceive the whole thing (without getting drunk / taking drugs)? Let me know how. Thanks.